Did you know the phrase ‘long in the tooth’ actually originates from horses? This is because their teeth continue to grow throughout their lifetime; their gums recede as they get older which gives them the appearance of longer teeth. This needs to happen because mastication (chewing) of fibre causes a lot of wear on teeth and horses should spend a long time eating – 16-18 hours every day. If they didn’t keep growing, horses would probably ‘run out’ of tooth as soon as their early teens! With horses living longer than ever, their teeth can start to let them down either becoming loose and wobbly or even falling out! Does your horse struggle to chew long forage? When horses are stabled hay and haylage are often their main fibre source. 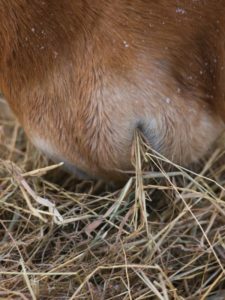 The long length of these forages can sometimes cause a veteran horse problems as their teeth become less efficient – they can spend hours chewing only to create balls of forage that they then drop (quid). Diastemas are not exclusive to old horses but are more common and this describes larger gaps forming between teeth where partially chewed food can get stuck and cause infection – eventually the tooth can become so diseased it falls out. Equally if too much partially chewed food passes further into the digestive system the risk of impaction colic increases significantly. In 2007 Dengie were involved with a study, conducted by Tracy Mann, a Writtle College student, to investigate how age-related poor dentition affected the consumption of fibre. The trial involved 12 horses and compared the amount of 3 different types of fibre (hay, Dengie Hi-Fi Senior and Dengie Alfa-Beet) they were able to consume within a certain time period. It was expected that a horse with poor dentition would consume less food in the same time as a horse with no dentition issues, however, the extent to which this happens was unknown. The reduction in intake was most significant for hay; those with poor teeth consumed up to two-thirds less hay in the same time period as those with no dental issues. The smallest difference was with the soaked product and only a slight reduction was seen with the short chop product. Some of those with dental issues actually refused to eat the hay completely whereas the soaked product was not refused at all. This shows therefore, just how significant dentition is to fibre intake. 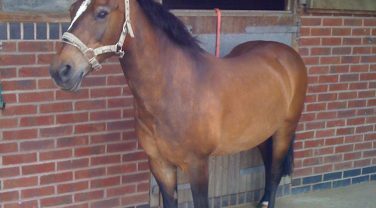 These results indicate why it is common to see considerable weight loss in veteran horses – especially over winter when hay is their primary fibre source. The study also illustrates how easy it is to provide an alternative fibre source for these horses and ponies. With soaked products showing the least difference between good and poor dentition, these feeds make ideal partial or complete hay replacers for those with poor teeth. The fibre particles in soaked products tend to be ground much smaller which makes them easier to chew and aids digestibility. If a horse can manage some short chop fibre then it would be beneficial to feed these products alongside the soaked feeds to help increase chew time. Dengie Hi-Fi Senior is the ideal chopped fibre to add to Alfa-Beet. Dengie’s comprehensive range of fibre feeds, both short chopped and soaked are all sympathetic to the horse’s digestive system and several of the products can also be used as partial or full hay replacers. Hi-Fi Lite, Hi-Fi Senior and Hi-Fi Good Do-er can all be used as a full hay replacer by simply replacing weight for weight with the hay. 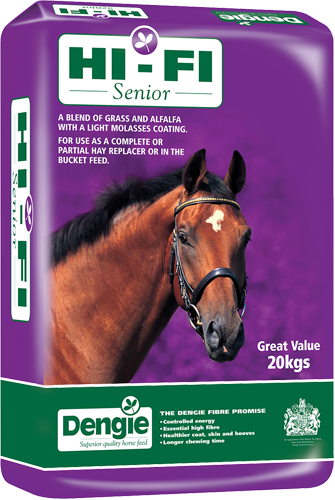 Hi-Fi Molasses Free, Meadow Grass with Herbs, Alfa-Beet, Hi-Fi Apple, Alfalfa Pellets and Grass Pellets can be used as partial hay replacers. All hay replacers can be fed from the floor or a large bucket rather than a net. However, like a haynet, larger quantities of these hay replacers can be left with your horse for them to “graze” on over a longer period of time than a bucket feed would usually take. As horses and ponies age, their nutritional requirements change and this needs to be taken into account when feeding your older horse or pony.